Innovation is 1% of invention and 99% of entrepreneurial action. Traditional project management approaches are impractical in a radical innovation environment characterized by a complex set of uncertainties on multiple dimensions and requiring experimental and entrepreneurial approaches. 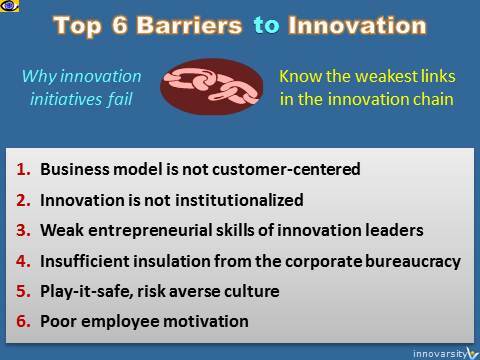 A radical innovation project cannot succeed if its manager lacks entrepreneurial leadership skills. “Established business is the main obstacle to entrepreneurship,“ warned Peter Drucker. Most companies don’t encourage entrepreneurial approaches, don’t have tolerance to mistakes, and don’t create conditions by which employees can act as entrepreneurs. It is essential to insulate new ventures from the main business and the corporate bureaucracy that would kill them otherwise. Successful companies reduce risk and maximize returns in a balanced way. In failing companies, aversion to risk impedes management from venturing into new areas. Managers in risk averse and sluggish companies prefer to stick to processes, technologies, and products they are comfortable with and concentrate on “yes, buts” rather than “what ifs”. As a result, many great new technology, process or product concepts are killed because of management’s fear of risk. Management fails to tear down cultures of bureaucracy, interference, and lack of autonomy, and to generate the right climate that encourages experimentation, creativity, rule-breaking, and individualism. Employees are not rewarded properly when they generate innovative ideas or achieve stretch goals set for them.